TV Promo Voice Talent for Networks, Cable, Affiliates. Order voice overs today! TV Promo Voice Talent Lili Wexu has a conversational voice many describe as “having gravitas”. Her voice cuts through as they say! She typically records TV promos from her professional voiceover iso-booth studio. She then delivers files via a file transfer service like Hightail as soon as she has finished editing files. Turnaround may take from 30 minutes to 2 hours after a scheduled recording, depending on the quantity of TV promos. Working with Tv promo voice talent Lili Wexu is a breeze. It’s like she has a metronome between her brain and her vocal cords! She adores her job and operates like a smooth, well oiled machine. She’s been at this for a long time (20 years to be exact!) Watch Lili recording voice overs on YouTube! For regular TV and radio commercials, visit this page. For TV Promo voice clients who are more particular, calling in, recording remotely or having her show up locally may be best. This way, clients can direct her during the TV promo session and be sure to get exactly what they want. 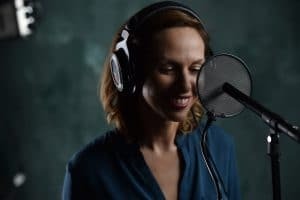 To hire TV promo voice talent Lili Wexu and to get access to the 2019 voice over rates, she will need to know who the client/product is (to assess potential exclusivity conflicts), where the production will be used, and for how long. If the voice over rates are in line with your budget, you may schedule a recording session by booking an available time on her calendar here. Here is a mention of her latest promo in Vanity Fair.